Neapolitan flavor apparently has its roots in my favorite country (that I’ve visited so far) in the world – Italy. I can’t even hear the word Italy without swooning I love it so much. Neapolitan refers to desserts brought to the US by Neapolitans, the residents of Naples, in Southern Italy. These desserts were layered, often frozen, with flavors easily found in Italy – Cherry, Vanilla and Pistaschio, representing colors of the Italian flag. In the US, the flavors morphed into popular American flavors: Strawberry, Vanilla and Chocolate. Neapolitan is a popular flavor of ice cream for kids who can’t decide which they want. Or maybe they want everything. I can relate to that! I loved it as a child, but am often less fond of it as an adult. 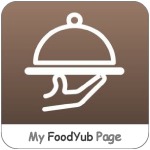 Until now…. 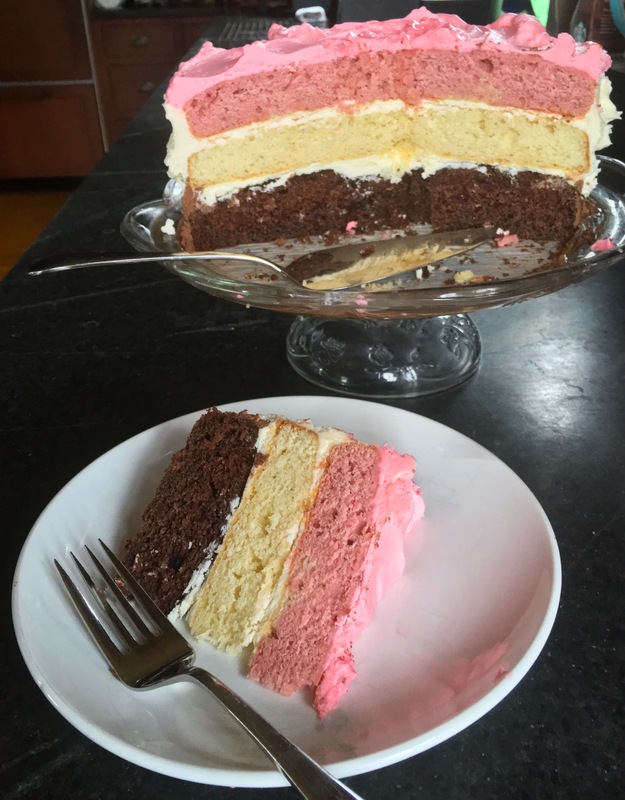 As a mother of a son who faces the same life-altering flavor choice at each birthday (I once made him a “rainbow” cake) I have come to appreciate Neapolitan once again. 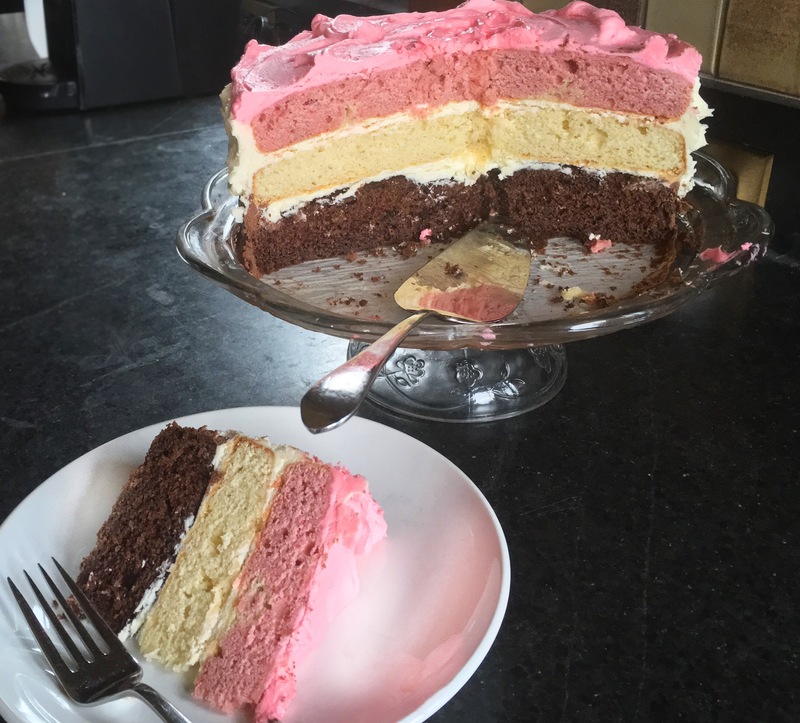 When he couldn’t choose what kind of birthday cake he might want, I suggested Neapolitan, admittedly ignorant of just how difficult a cake it is to put together. Most recipes call for preparation of 3 separate batters. Uggghhh! What had I gotten myself into? 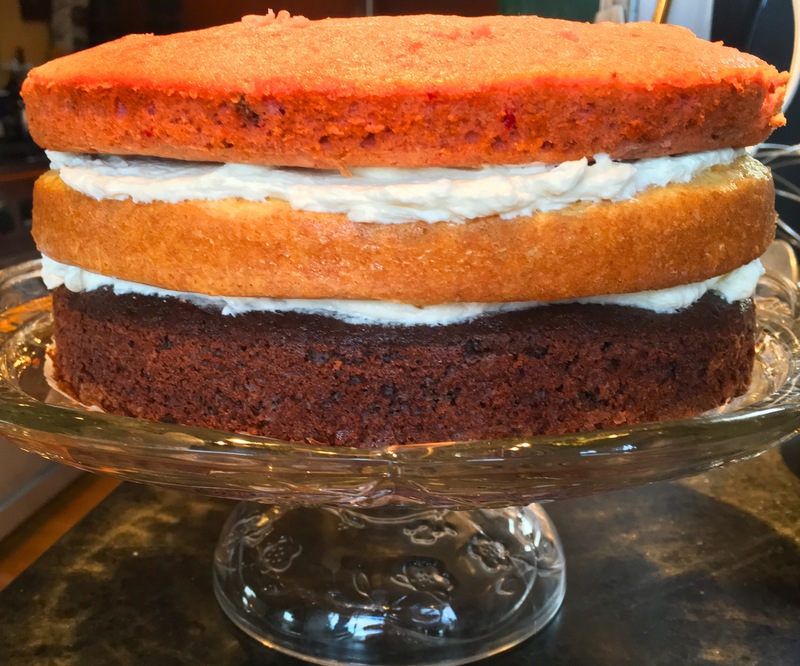 Fortunately, with a bit more searching, I found this Taste of the South Magazine recipe that involves preparation of a single white cake batter, separating out portions which, with a couple extra ingredients, become the strawberry and chocolate layers. And this same plan works for the frosting, too, if you want 3 different flavors there, too. I used my all-time favorite frosting recipe, Leslie Mackie’s White Chocolate Frosting from The Macrina Bakery and Cafe Cookbook. It is a white chocolate-cream cheese frosting that is simple to make. I cannot think of a single cake, cookie, cracker or fruit that I wouldn’t top with this delectable stuff. 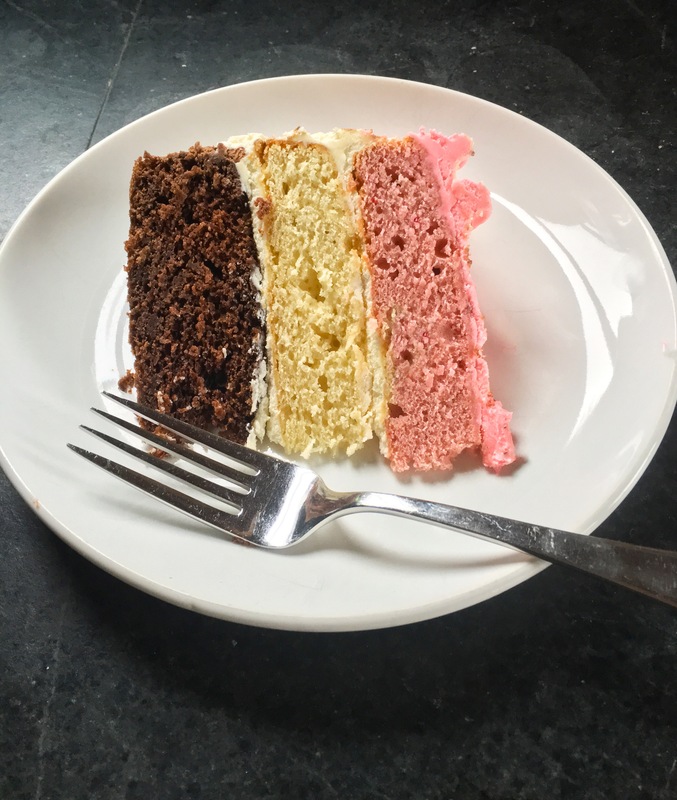 And, let me tell you – this cake is so flavorful with a brilliant moist texture, it will satisfy both the Neapolitan lover and skeptic (that was me!). 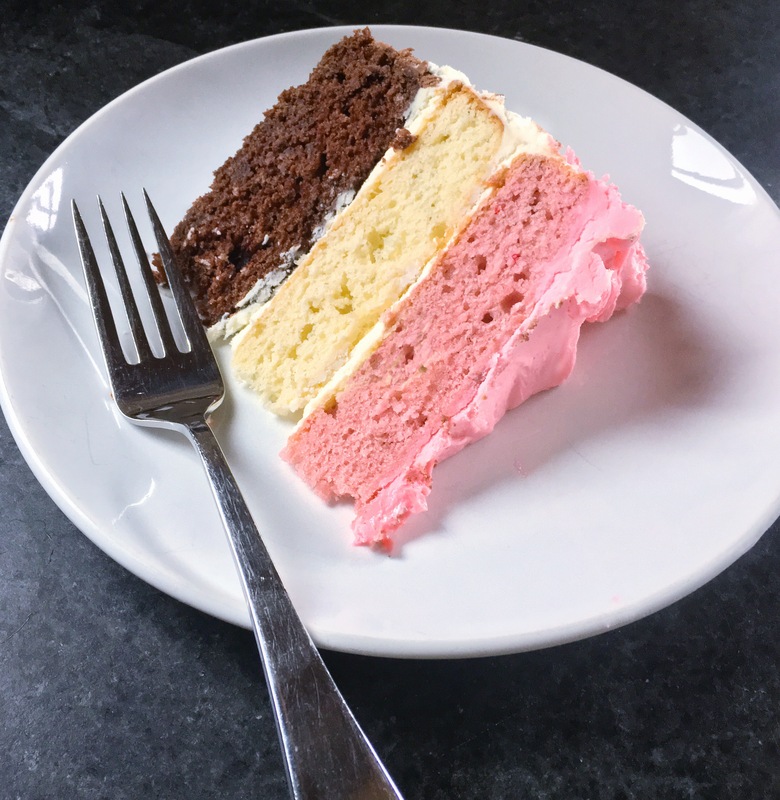 So the next time you are facing indecision over flavor choice, consider Neapolitan. It is definitely a people pleaser! Enjoy! Preheat oven to 350F. Prepare 3-9″ baking pans. Butter (or spray) the bottom an sides of each pan. Top with 9″ round of parchment paper, then butter (or spray) paper, then flour. In a stand mixer, cream butter and sugar for about 5 minutes, until light and fluffy. You will need to scrape the bowl down several times. It is ready when you can feel with you scraper that the mixture is “light” an looks fluffy. Add the eggs one at a time, until each is fully incorporated. Add vanilla, mix in. In a separate bowl, whisk together cake flour, baking powder, 1/4 c AP flour and salt. With mixer on low, alternate additions of the flour mixture and the milk, starting and ending with the flour mixture. Beat until combined. Ready for the oven. Note different textures of each batter! Place 2 c batter into one of the baking pans. Divide remaining batter into two medium bowls. Into one bowl, add strawberry jam and red food coloring. Mix or beat until well combined. Pour into second baking pan. Into the third pan, add cocoa, baking soda and boiling water. Beat or mix until combined, then place into the third baking pan. Bake cakes 25 minutes. Cool 10 minutes, then invert on wire racks and cool completely. While cakes cool, prepare frosting. Place white chocolate chips in a metal bowl. Place bowl 2″ above simmering water on a stovetop. While simmering, stir occasionally until chocolate is melted an smooth. Set aside to cool to room temperature. In a stand mixer, combine butter and sugar. Mix with paddle attachment at medium-high speed until smooth, about 5 minutes. Add cream cheese and resume mixing for 5 more minutes until there are no visible lumps and mixture is smooth. Add lemon juice, mix in. Lastly, add the chocolate, continue to mix on medium to medium-high for about 2 minutes. During this time, frosting should visibly become smooth and light in texture. 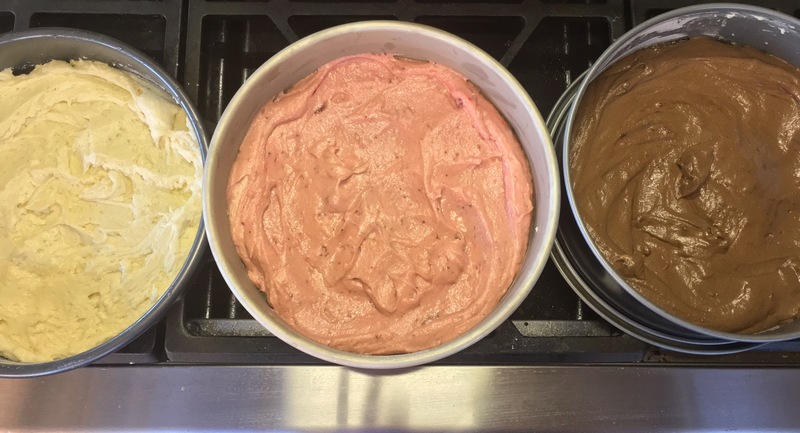 At this point, divide the frosting into 3 separate bowls. You will need to divide it roughly 40%-40%-20%. The first 40% bowl will be white frosting. To the second 40% bowl, add strawberry extract and red food coloring. Stir until combined. In the 20% bowl, sift the cocoa powder, stir until well combined. If the frosting seems thin at this point, refrigerate 15-20 minutes until it is spreadable. Place chocolate cake layer on serving plate. Top with layer of white frosting. Add white cake layer, then another layer of white frosting, then the strawberry cake. Frost sides of the chocolate layer with chocolate frosting, white layer with white, and the stawberry (top) layer with the strawberry frosting. You can be as fancy as you like, or just make the frosting smooth. Either way, it is delicious! Enjoy.